édité le 02/05/2013 - Plus de news de "Socar" - Voir la fiche entreprise de "Socar"
According to the press-release of SOCAR and “Shah Deniz” field operator bp-Azerbaijan, the Shah Deniz consortium has begun evaluating binding transportation offers from the two pipeline consortia offering to carry gas from the “Shah Deniz” field in Azerbaijan into Europe. This represents another important milestone in the realisation of the Southern Gas Corridor. 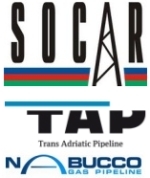 The two consortia, Nabucco Gas Pipeline International and Trans Adriatic Pipeline (TAP), have been in extensive negotiations with the Shah Deniz consortium following delivery of their initial gas transportation offers at the end of March 2013. Those offers have now been approved by their shareholders and have become final and binding. Nabucco Gas Pipeline International and Trans Adriatic Pipeline (TAP) are offering to carry 10 BCMA of gas to different markets in Central and Southern Europe. The Shah Deniz consortium is currently finalising its assessment of these offers. The press-release states that “Shah Deniz” Stage 2 project will bring gas from the Caspian Sea to markets in Turkey and Europe, opening up the ‘Southern Gas Corridor’. “Shah Deniz” Stage 2 is expected to add a further 16 billion cubic meters per year (bcma) of gas production to the approximately 9 bcma from “Shah Deniz” Stage 1.